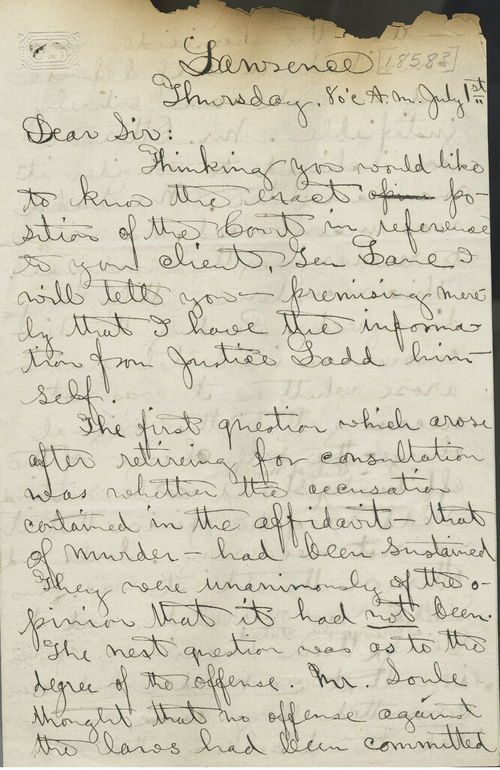 Ewing's correspondent, John F. King of Lawrence, had just given testimony in the Lane-Jenkins hearing that supported Lane's testimony that he shot Gaius Jenkins in self-defense on June 3, 1858, and wrote to provide Ewing (one of Lane's attorneys) with some information regarding "the exact position of the court." In the preliminary hearing, conducted by three justices of the peace (Erastus D. Ladd and two others) beginning on June 15, the decision was that no murder had been committed. John F. King to Thomas Ewing, Jr.